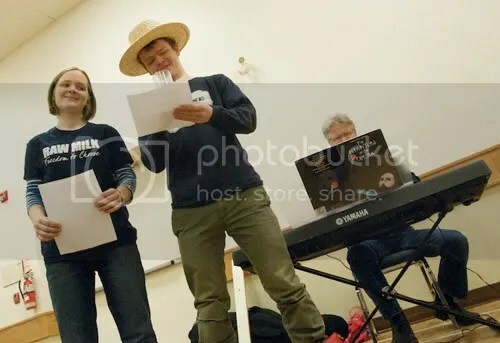 Shirley Ann Wood's children, Sylvia and Lyndon, perform a raw milk version of Phantom of the Opera, accompanied by their father, to kick off yesterday's post-verdict rally. Shirley Ann wrote the words. We were both pleased and impressed by the judge’s development to his conclusions and the conclusions themselves. Congratulations. I hope you take the time to celebrate, because it is important to fully acknowledge this joy and share it with others. “Yesterday’s court decision allowing Michael Schmidt to continue his raw milk cooperative is already being touted as a victory for everything from family farms to the constitutional rights of both consumers and producers. 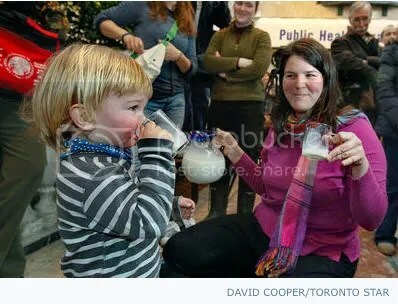 William Schmidt, 2, with mother Elisa VanderHout, toasts his dad’s raw-milk victory in Newmarket. (Jan. 21, 2010) Caption & photo from the Toronto Star. “The cows will still give their milk and their owners will still savour frothy mouthfuls straight from the farm. But now, the infamous cow-share program of Durham, Ont., is legal in the eyes of the law. Health officials more concerned about raw milk than heroin in Beautiful British Columbia? Please note that this is a large file (28.4 Mb) as it is 41 pages of image scans. Be prepared for some heavy duty legal reading. Download that file here — look for the green box. In case you’ve missed the story so far, Michael Schmidt was acquitted on all 19 charges, and the judge ruled that cowshares are outside the jurisdiction of regulators. So this is a significant ruling that could open the door to more cowshare farmers making raw milk available to more people. Traffic report on the Bovine for Jan. 21, 2010. This was a little before the end of the day.